Wayne Gretzky interestingly spent 99.9% of his illustrious NHL playing career as a member of the three teams (Oilers, Kings, and Rangers) depicted in this UDA designed image. Gretzky is shown in the home white jersey chronologically from left to right. Wayne briefly played for the St. Louis Blues during the 1995-96’ season between his stint in LA and New York. Ironically, these jerseys would presently be considered his away jerseys after the NHL switched the home and away jersey color during the 2003-04 season. 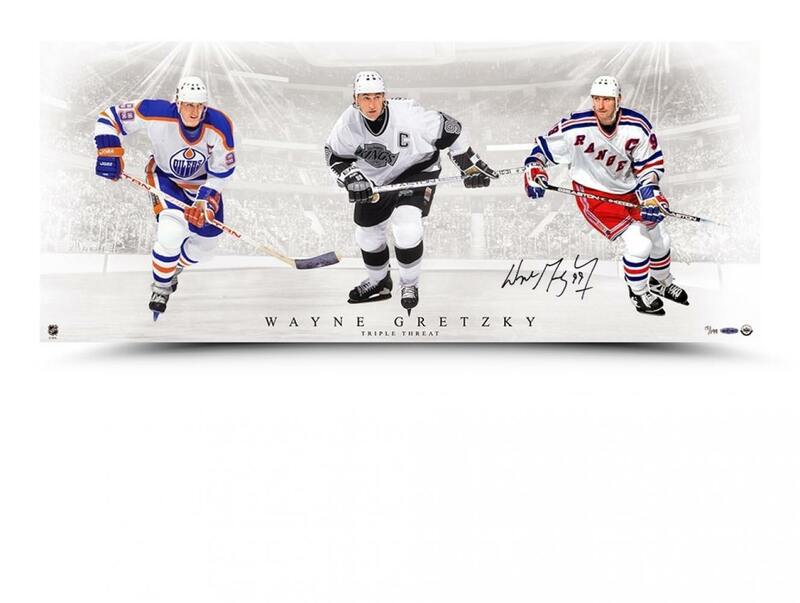 "Triple Threat" is a 36”x15” image in which Gretzky has inked his name in black paint pen. Gretzky’s signature was witnessed under Upper Deck Authenticated’s Five-Step Authentication Process. Product depicted for demonstration purposes only and is subject to change without further notice. Product subject to availability.